New Service Gives Listeners Ability To Rewind, Pause, Or Restart A Live Stream From The Beginning Of A Program. 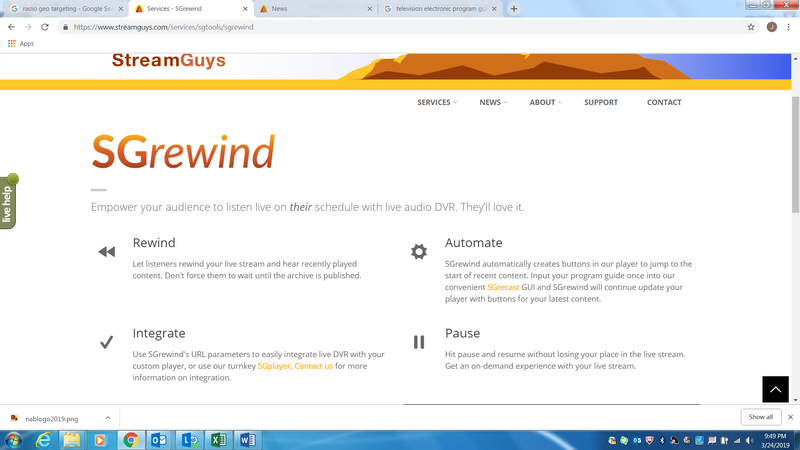 The upcoming 2019 National Association of Broadcasters Show, April 6 – 11 in Las Vegas will mark the North American debut of SGrewind, the latest module in StreamGuys’ live stream repurposing and workflow management system. The cloud-based platform lets radio broadcasters record, repurpose, replay and rewind their live streams to improve audience experiences and create side channels and podcasts. This report was originally published last month in the Radio & Television Business Report.